Singapore-based blogging colleague, Marc of Creative Spark, sent me this article about hidden, unlisted chemicals in perfumes. It’s time for a perfume update anyway, so the article is very timely. I do have a liking for Chanel Coco but was horrified to learn it contains 18 unlisted toxic nasties. A report from the Environmental Working Group (EWG) has identified perfumes that have an average of 14 secret chemicals in them and these are not listed on the perfume bottle or label. I know that in the US, there is a loop hole in Federal Law (Federal Fair Packaging and Labeling Act of 1973), which allows perfume houses to claim their fragrances are trade secrets. Perfume houses can call their scent “parfum” or “fragrance” and are not required to separately list the ingredients. This also applies to shampoos, body washes, air fresheners, dishwashing detergents etc that use the word “fragrance”. Behind this word is an awful lot of toxic stuff swirling around. And the problem is that many of the unlisted chemicals (especially when multiple chemicals lurk in a product) can trigger allergic reactions and even disrupt hormones. These chemicals can be absorbed through the skin or inhaled. The Campaign for Safe Cosmetics commissioned the report and the EWG churned through the data. 17 perfumes were tested and what’s really scary is to read that 12 of the 17 perfumes contained diethyl phthalate, a chemical linked to sperm damage and behavioral problems. If you use American Eagle Seventy Seven, you might want to think again, because the analysis revealed that this scent has a whopping 24 unlisted, secret squirrel toxic chemicals in it. Unfortunately, Coco Chanel followed with 18 nasties. Musk ketone is another synthetic fragrance ingredient that was found in the tested perfumes. Musk ketone is absorbed by the body, concentrates in human fat tissue and breast milk and has a possible link to cancer. 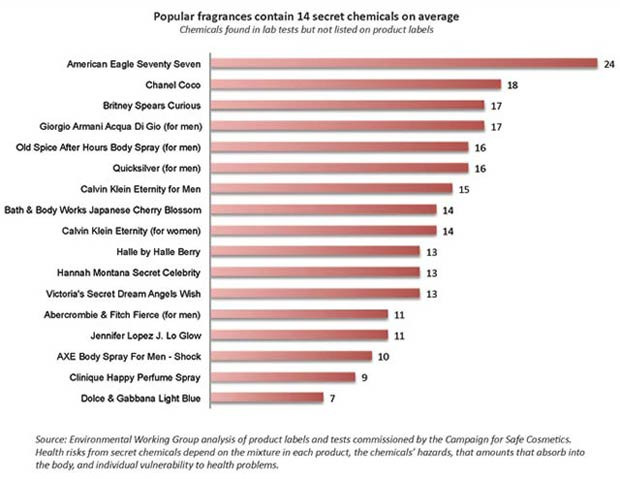 Here are the 17 scents tested, along with the number of clandestine chemicals contained in them. Truly scary. And as the report points out, consumers can hardly make an informed decision if we don’t know what ingredients are really in products. In the 17 perfumes tested, there were 38 secret chemicals. Do yourself a favour and read the full report. Download it here. Entry filed under: Useful resources. Tags: Campaign for Safe Cosmetics, chemicals, Environmental Working Group, EWG, health, Perfumes. Grappling with The Bureaucracy	Achtung Google!